Raintree Sub, Brick Ranch with Finished basement. Troy Schools. Open floor plan includes spacious kitchen and nook with wood style laminate flooring, oak cabinets, beveled edge Formica counters. Open to great room with vaulted ceiling, built-in shelving, fireplace and wet bar. Living room is very spacious, three bedrooms and 1 1/2 baths on the main floor. 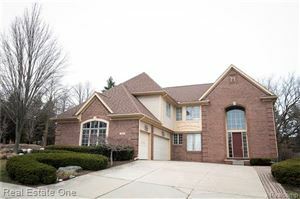 The lovely finished basement has a large recreation room, fitness area, optional 4th bedroom with walk in closet. Laundry is in basement. Brand new hot water tank. Kitchen and laundry appliances are included. Large lot with 2 car attached garage. Garage has a separate furnace/heater. 2 hour notice required for all shows. The data relating to real estate properties on this website was last updated as recently as 4/22/19 1:50 AM PDT.